On February 4, 2019, Gov. Phil Murphy signed A-15, which sets New Jersey on the path to raise the minimum wage to $15 by 2024. The new law raises the minimum wage in increments, increasing the wage to $10 per hour on July 1, 2019 and to $11 on January 1, 2020. Thereafter, the minimum wage will increase $1 every year until reaching $15 per hour in 2024. 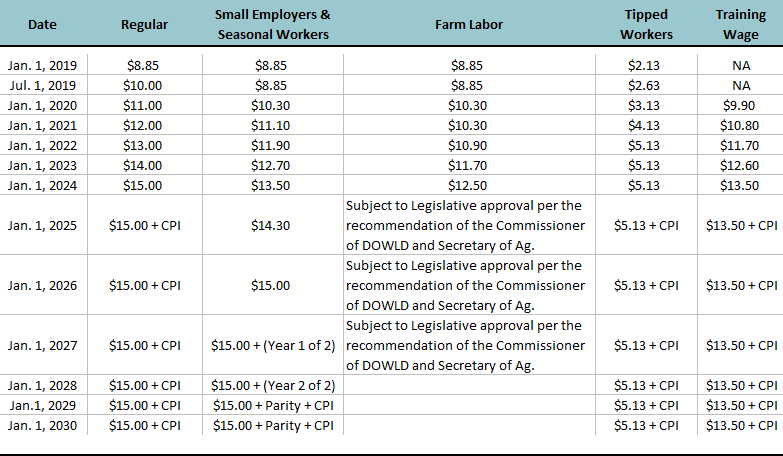 The minimum wage will increase at a slower rate for small businesses with less than six, seasonal businesses, and farm labor. Also included in this bill is an increase in tipped workers’ minimum wage rates and a training wage. This Fast Facts helps employers understand when and how these changes are coming, and in what ways they will be affected.